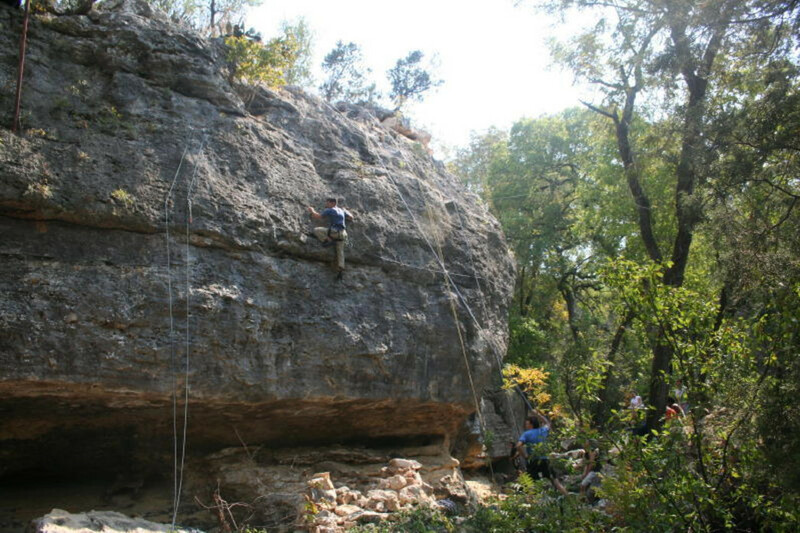 Monster Rock is a unique climbing destination located in a fissure between two rock walls. It's located in the backyard of a private home, and just so happens to house some sharp limestone, garnished by the fine hands of experienced route-setters. For $5 a day, you can gain access to 3 cliffs, 52 routes, 31 variations, and 37 bouldering problems - plus a practice wall and a river to cool off in. Monster Rock is open during daylight hours 7 days a week and provides a nice break from the heat during the summer. All you have to do is call, text, email, or Facebook message the proprietor, John Hogge, before you want to climb. Then, simply sign a release form once you arrive. The nice thing about Monster Rock is that the owner takes reservations on short notice -- like "in the car, on the way" notice. You don't need to wait for a response from him before you can start climbing. He simply likes to keep track of the climbing traffic. 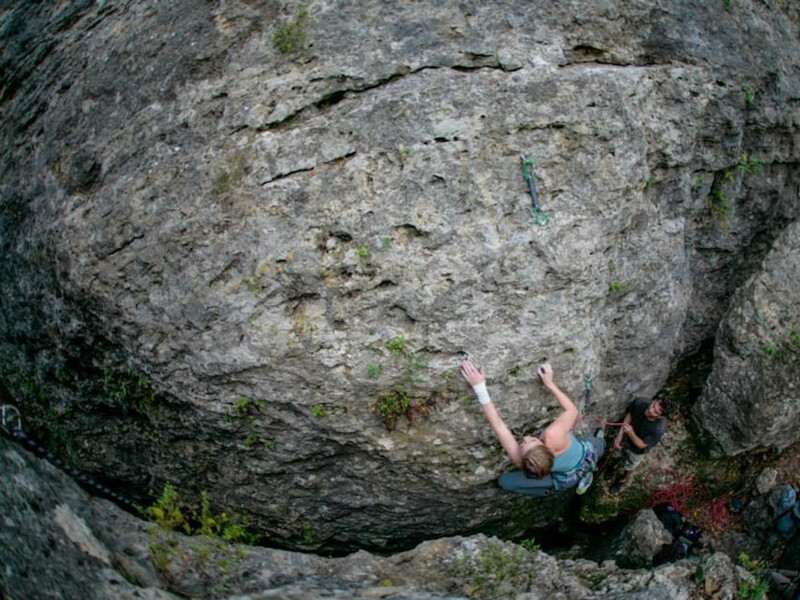 Routes vary in difficulty from 5.7 to 5.13, with plenty in between. 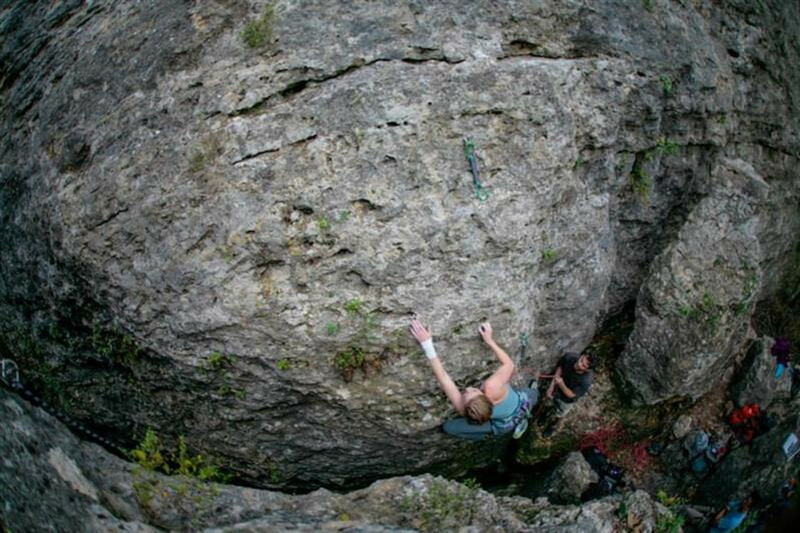 Expect a fast approach to overhangs, pits, cracks and up-routes. John also maintains a great website for Monster Rock with directions, route counts, guidebooks, pictures, and a guest book -- so you can leave your mark on the beast! Two stick clips are kept on site for your use. Expect for the rock to be dry approximately 24 hours after rain. This location is primarily for climbers, but friends are certainly welcome to tag along to escape the summer heat or take a dip in the lake. Warning: In the pit, between the two cliffs, it's possible to hit the wall behind you if you fall on lead or top-rope. Consider these risks before climbing these routes, and consider wearing a helmet. From IH-35, take 45th, Parmer, or 6th street west to Mopac (Loop 1). Heading south on Mopac, take Southwest Parkway heading west. Turn right at the junction of Highway 71. Drive down Hwy 71 for roughly 15-20 minutes, looking for a Chevron gas station on the right side of the road, at the corner of 71 and RR 2322 (Pace Bend Rd). Turn right on Pace Bend Road, and go roughly one mile. Monster Rock is located on the second lot of the left after the major power lines. Look for the mail box labeled "2208". Take the loop to 281 and head north for 65 miles. Head east on Highway 71 for 16 miles, then take a left on Pace Bend Road (RR 2322). Continue down Pace Bend Road for roughly one mile, and look for the mailbox #2208 on the left side of the road. Pull into the lot with this mailbox. Entrance: Walk down the hill between the two houses to the bridge stairway spanning across a dark chasm. After crossing the bridge, walk left to two ladders and descend into the chasm. Ladders are impassible to dogs and young children. The daily pass costs $5/day per person. No dogs are allowed due to ladder access and limited space. 2208 Pace Bend Road S.